Parnelli Jones had long established his name as a sprint car, NASCAR, and Indy car driver before he ventured into off-road driving. Perhaps it was his early experience drifting sprint cars around dirt ovals, or perhaps it was just his natural talent, which was honed to a competitive edge in all forms of racing he excelled at since. But Jones took to desert racing like a true natural. His excursion back to the dirt led to one of the most well-known off-road racing trucks ever built: the Big Oly Bronco. After Jones won the second running of the Baja 500 in 1970 in a two-wheel-drive Ford Bronco—built by Bill Stroppe using quite a lot of factory Bronco parts—he eventually convinced Stroppe that a scratch-built race Bronco could do much better. Like his Baja-500-winning ride, this Bronco used a twin-I-beam suspension, this time with trailing links mounted at the leading edge of the chassis rather than the leading link radius arms that a factory Bronco with a solid axle would have used. It allowed the suspension to react more naturally to bumps and cycle upward in its 10–12 inches of wheel travel more naturally. Think of swapping a leaf spring shackle to the rear. Allowing the suspension to move slightly rearward as it hits an obstacle is much less jarring than a suspension that has to swing forward as it absorbs the impact. There was no need for an exotic or complicated drivetrain, just one that would survive the grueling desert race conditions. Jones chose a 351-cubic-inch Windsor small-block V-8 and a three-speed C4 automatic; the former got an Isky cam and the latter eventually upgraded to the beefier C6 three-speed. The Bronco’s body and ladder frame were tossed, replaced by a 4130 chrome-moly tube chassis, aluminum inner panels, and a fiberglass body. The fiberglass body is three inches narrower than a factory Bronco, and it’s also sectioned three inches shorter. You’d be excused if you missed that fact, as the most obvious addition was the big wing mounted on the roof that was adjustable on the fly to apply downforce and keep the 400-hp desert beast properly planted. 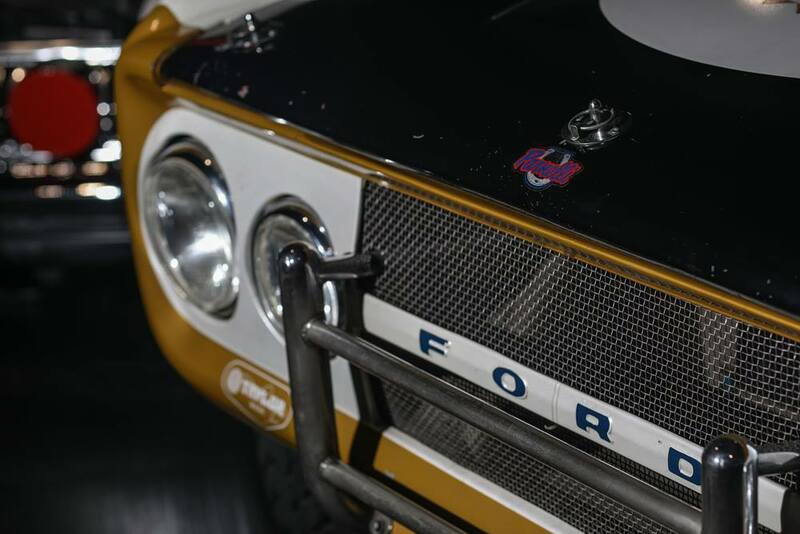 Parnelli was right about the one-off Bronco; it demolished the competition. Jones won back-to-back Baja 1000 championships in the 351-Windsor-powered brute and made an indelible mark in off-road racing. It may well have been the genesis of the Trophy Truck. 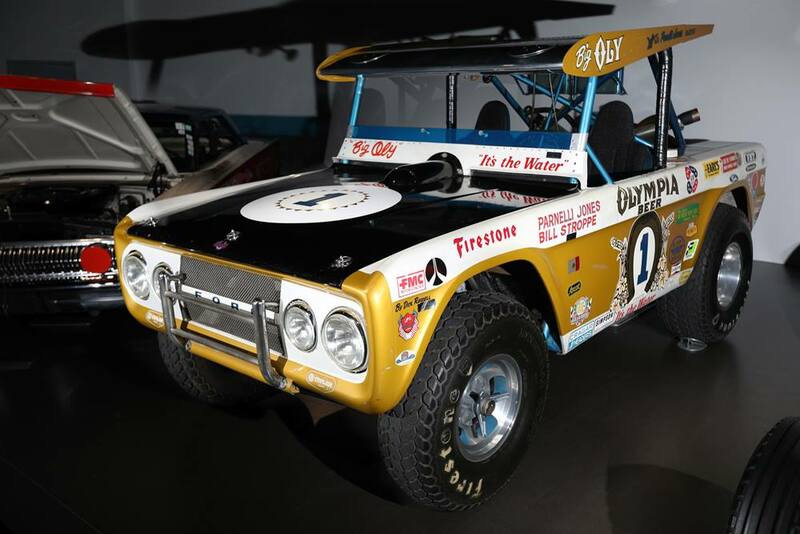 The Big Oly Bronco currently belongs to Parnelli, but he’s allowing the Petersen Museum to display it as part of the Legends of L.A. exhibit, since it was built in Stroppe’s shop just 25 miles southwest of the museum. If you’re visiting Los Angeles and would like to see it in person, here’s your chance.